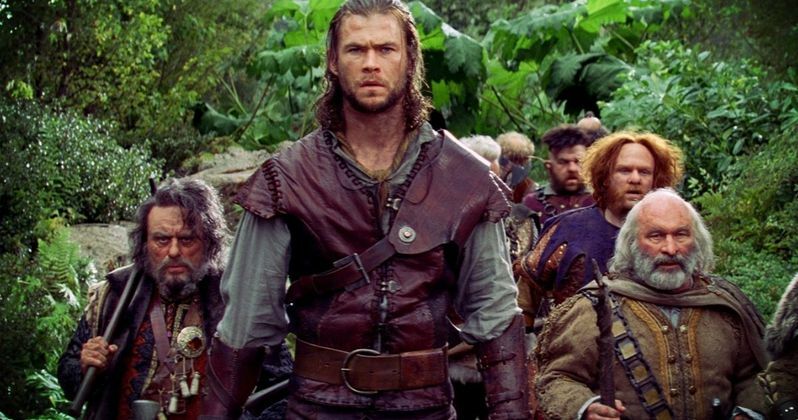 Universal Pictures is currently moving forward with The Huntsman, a sequel to their 2012 action-adventure Snow White and the Huntsman that will primarily focus on Chris Hemsworth's title character and Charlize Theron as the evil Ravenna, with Emily Blunt also in talks for an unspecified villain role. We already know that Kristen Stewart is not returning as Snow White, but a new report from Deadline reveals that Nick Frost, Toby Jones and Eddie Marsan, who played three of the seven dwarfs in Snow White and the Huntsman, will not be back for the follow-up. The sequel will only feature two of the dwarfs, although it isn't entirely clear yet which two they will be. Eddie Marsan was forced to bow out due to schedule complications with Showtime's Ray Donovan, while both Nick Frost and Toby Jones "appear not to have agreed on terms for the second installment." The remaining dwarfs in Snow White and the Huntsman were played by Ian McShane, Johnny Harris, Ray Winstone and Brian Gleeson. Cedric Nicolas-Troyan is directing from a script most recently written by Frank Darabont, who was initially set to direct himself before dropping out earlier this month. Evan Spiliotopoulos and Craig Mazin worked on previous drafts of the screenplay. The story will center on The Huntsman and Ravenna, and how their paths first crossed before they both met Snow White. It isn't known when production may begin.